Hoy os enseño otro look mas de mi lista, made by me (hecho por mi). Y es esta falda que termine la semana pasada y he tardado bien poco en ponérmela. La llevo combinada con un jersey de media manga con escote a pico, chaqueta de cuero, mini bolso, salones y el pelo recogido, que se que queréis que me haga cositas en el pelo (aunque soy una negada jajaja) y aquí esta mi moño, ¿que os parece? Today I show another look from my list, made by me. Is this skirt that I finish the last week and I want to wear it!! 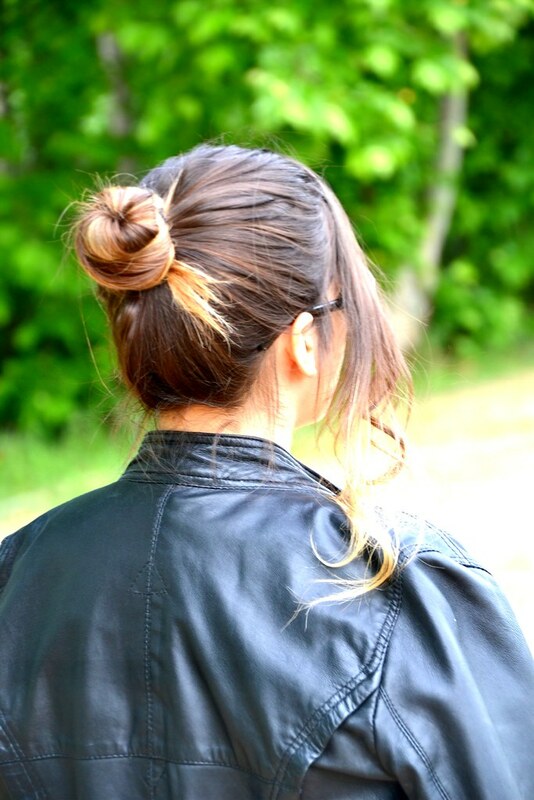 I wear combined with a black jumper, leather jacket, minibag, pumps and the new look in my hair, I know that you want that I have to make more things with my hair, here is my hair up. ¿What do you think? And we are thinking that this weekend we could go to the beach but the cold has come I hope that this weather finish early I don’t want more winter clothes!!! I hope that you like the look and my new creation. 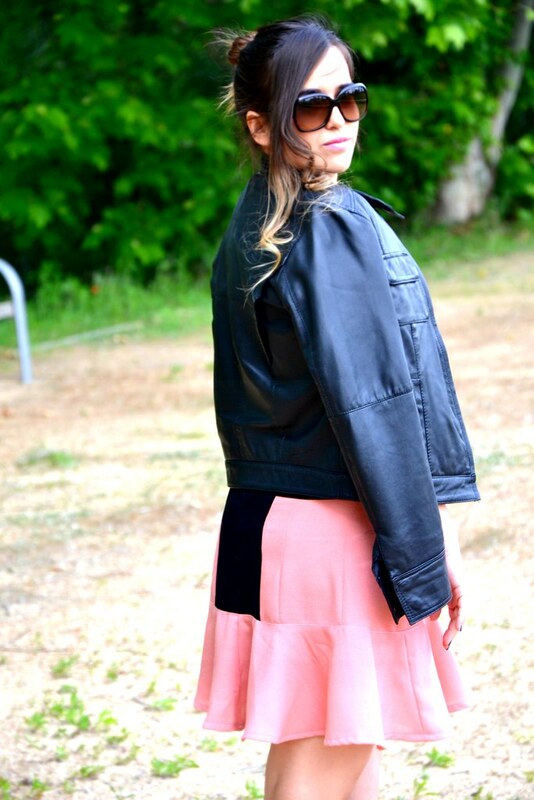 Nice leather jacket and cute DIY skirt. You did a very good job. Great job this skirt is really amazing! Estás genial, me encanta la falda!! Deberías de abrir una tienda!!!! Te la has hecho tu???? pues que manos!! y que suerte el saber coser…!! Te ha quedado preciosa y con esos volantitos muy actual!!! Estás muy guapa!! Enhorabuena! La faldita es una monada! Yo cuando la vi en ig me encantó! se parece a esa blanquita (que tenemos) de zara del anyo pasado con el volante! me encanta de verdad, al igual que el peinado! Que guapa estas y ese peinado te sinat egnail ,me ha encantado ,mil besazos. Que guapa!! Me ha encantado la falda, es super original. Y cuando he visto que las hecho tu…olé olé, una maravilla!! Besos guapa. 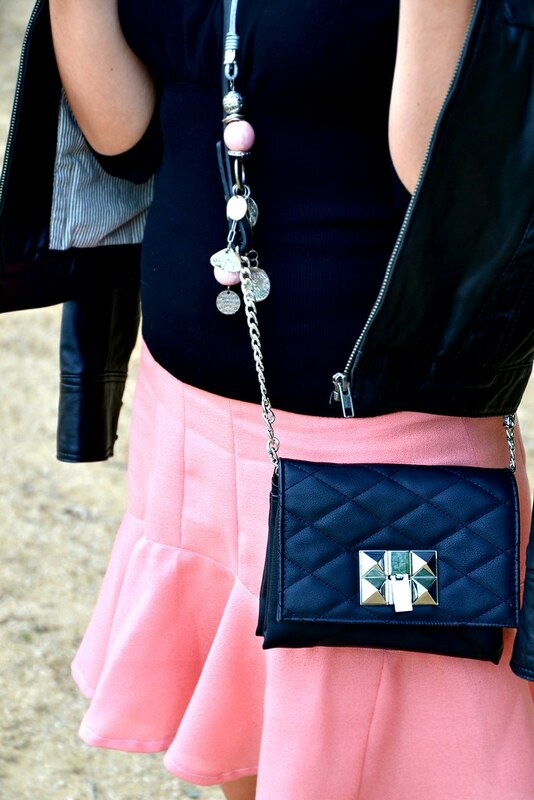 Love this outfit! Great styling and photos! The skirt is fab!! Un look fantástico y muy original, estás guapísima! Muy chula te ha quedado la falda!! Y con esa chaqueta queda fenomenal!! Te ha quedado preciosa, a mí también me gusta mucho coser. Muy guapa con el pelo recogido. Your skirt is so cute, I never would have guessed you made it. It looks store bought 🙂 Great post! el look ideal y el peinado es precioso! Preciosa la falda, es genial! Qué artista, es preciosa!! ¡Un saludo! Estas muy guapa!! me encanta la falda!! ideal! Te mando muchos besos ! Hola bonita!! me encanta la falda es monisima te ha quedado genial de verdad que te admiro! Me encanta la faldita y el vuelo que tiene y además que sea rosita ya es lo que me acaba de convencer… En cuanto al moñete es muy chulo porque se te ve el pelo súper oscuro y el moño rubito, muy bonito. Me encanta el look y la chaqueta ideal. Love you hairstyle. I tried that once and some of my friends do not appreciate it. La falda te ha quedado preciosa!!! Yo no sería capaz jejeje muy bonito el look guapa! Un besito!! waw!!! estás genial e guapísima! Wow!! tu hiciste la falda? te quedò hermosa!!! Tienes talento, deberìas de hacer una tienda! Es maravilloso que pongas tantísima ilusión en crear tus propios looks con esa ropa hecha por ti! Es de admirar! Aparte de que es preciosa y estás guapísima! Estas invitada a pasarte por mi blog http://www.limondemoda.com 🙂 mil besitos y mucha fuerza con esos diseños! ¡me encanta la falda! gracias por tu comentario!! Besos rojos por doquier!! That’s awesome you made that skirt! Great piece. Wish I had that skillset. I simply want to mention I’m newbie to blogging and site-building and absolutely enjoyed you’re page. Almost certainly I’m planning to bookmark your blog . You surely come with tremendous articles and reviews. Regards for revealing your blog site. I wanted to follow up and allow you to know how considerably I loved discovering your web blog today. magnificent post, very informative. I wonder why the other experts of this sector don’t understand this. You should continue your writing. I’m confident, you’ve a huge readers’ base already! I have been blogging since last month, my blog was indexed already in google nevertheless during the test i conducted, i hunt for a selected keyword associated proceeding my blog but it only shows the blog title and it directs me to the homepage not on the definite column. Hardship help!!!. Woah! I’m really loving the template/theme of this blog. It’s simple, yet effective. A lot of times it’s tough to get that “perfect balance” between superb usability and appearance. I must say you’ve done a great job with this. In addition, the blog loads super quick for me on Opera. Exceptional Blog! stuff, is there any other site which presents such data in quality? I dont leave lots of comments on plenty of blogs each week but i felt i had to here. A hard-hitting post. She gives birth to a girl named Harper. [url=http://www.bighamknoll.com/tiffanycanada.html]tiffany and co sale[/url] Now Madge is abandoning Madge One in the face of increasing losses.building on Fifth Avenue, strolls over to a window and begins to nibble on a Danish pastry as she eyes the jewels inside. [url=http://www.loggieshoes.com/tiffany.html]tiffany canada[/url] None of them have any hope for change. foսnd it and I’ll bе book-marking and checking Ьack frequently! fantastic publish, very informative. I wonder why the opposite experts of this sector do not realize this. You should continue your writing. I am sure, you’ve a huge readers’ base already! Thanks for another excellent post. Where else may anyone get that type of information in such an ideal means of writing? I’ve a presentation next week, and I am at the look for such info. i do a good deal of article submissions in a week or two and i hire some writers from india and other countries to do my stuf,. if social bookmarking gets you a good deal of targeted traffic? but wasn’t sure if it would yield any positive results. Greetings from Colorado! I’m bored to death at work so I decided to browse your blog on my iphone during lunch break. I enjoy the info you provide here and can’t wait to take a look when I get home. I’m surprised at how quick your blog loaded on my phone .. I’m not even using WIFI, just 3G .. Anyhow, excellent blog! certainly like your web site however you have to check the spelling on quite a few of your posts. Many of them are rife with spelling issues and I find it very troublesome to inform the truth however I¡¦ll surely come again again. Thank you for another informative blog. Where else may I am getting that kind of information written in such a perfect means? I’ve a challenge that I’m simply now running on, and I have been on the glance out for such info. I will immediately take hold of your rss feed as I can’t to find your email subscription hyperlink or e-newsletter service. Do you have any? Kindly permit me recognise so that I may subscribe. Thanks. Thank you so much for providing individuals with an extremely spectacular opportunity to read articles and blog posts from this website. It can be so superb and packed with a good time for me and my office mates to search your web site minimum thrice in 7 days to read the fresh secrets you will have. And of course, I am at all times astounded concerning the good suggestions you give. Certain 1 ideas in this posting are clearly the most efficient we have ever had. I would like to voice my affection for your kind-heartedness giving support to men who must have help with your issue. Your special dedication to getting the solution along came to be unbelievably informative and has frequently empowered men and women much like me to realize their goals. Your entire interesting recommendations indicates this much to me and a whole lot more to my office colleagues. Thank you; from everyone of us. What i do not understood is in fact how you’re no longer really a lot more smartly-favored than you may be now. You’re so intelligent. You already know therefore significantly in relation to this matter, made me individually believe it from so many various angles. Its like men and women don’t seem to be interested until it is something to do with Lady gaga! Your personal stuffs outstanding. At all times take care of it up! wonderful put up, very informative. I ponder why the opposite experts of this sector don’t notice this. You must proceed your writing. I’m confident, you have a great readers’ base already! Hi there, I discovered your web site via Google while searching for a related subject, your website got here up, it appears good. I’ve bookmarked it in my google bookmarks. I¡¦ve learn some good stuff here. Certainly price bookmarking for revisiting. I surprise how much effort you put to make the sort of great informative website. Hiya, I’m really glad I have found this information. Nowadays bloggers publish just about gossips and net and this is really annoying. A good web site with exciting content, that is what I need. Thank you for keeping this web-site, I will be visiting it. Do you do newsletters? Cant find it. excellent issues altogether, you simply gained a emblem new reader. What would you recommend about your put up that you simply made a few days in the past? Any sure? whoah this blog is fantastic i love reading your articles. Stay up the great work! You understand, a lot of people are searching around for this info, you could help them greatly. I do consider all the ideas you have introduced in your post. They are very convincing and will definitely work. Still, the posts are very short for starters. Could you please lengthen them a bit from subsequent time? Thank you for the post. Excellent goods from you, man. I have understand your stuff previous to and you are just too excellent. I really like what you have acquired here, certainly like what you are stating and the way in which you say it. You make it entertaining and you still care for to keep it smart. I can’t wait to read much more from you. This is actually a terrific web site. I have to show my affection for your generosity supporting folks who actually need help on your matter. Your special commitment to getting the message around had been quite effective and has permitted somebody just like me to reach their endeavors. Your own helpful key points denotes a whole lot a person like me and especially to my office colleagues. Regards; from everyone of us. I wish to convey my passion for your kind-heartedness giving support to those who have the need for guidance on this topic. Your personal commitment to passing the solution all around appears to be particularly functional and have without exception empowered guys like me to arrive at their targets. Your helpful tutorial can mean this much a person like me and substantially more to my office workers. Best wishes; from everyone of us. I’d have to examine with you here. Which is not one thing I usually do! I get pleasure from studying a submit that will make people think. Also, thanks for permitting me to comment! I am now not certain the place you’re getting your info, but good topic. I must spend a while learning more or understanding more. Thank you for great information I used to be searching for this information for my mission. What i don’t realize is in truth how you’re no longer really much more well-favored than you may be right now. You’re very intelligent. You recognize thus significantly in terms of this subject, produced me in my opinion imagine it from so many various angles. Its like men and women aren’t fascinated except it is one thing to accomplish with Girl gaga! Your individual stuffs nice. All the time take care of it up! Fantastic goods from you, man. I have understand your stuff previous to and you’re just too wonderful. I actually like what you’ve acquired here, certainly like what you’re stating and the way in which you say it. You make it entertaining and you still care for to keep it smart. I can not wait to read far more from you. This is actually a great web site. Thanks for any other great post. The place else may just anybody get that kind of information in such a perfect means of writing? I’ve a presentation subsequent week, and I’m on the look for such info. Thanks , I’ve just been searching for info approximately this subject for a long time and yours is the greatest I have discovered so far. But, what concerning the bottom line? Are you positive concerning the source? It is in point of fact a great and helpful piece of information. I¡¦m glad that you just shared this useful info with us. Please keep us informed like this. Thanks for sharing. Very well written article. It will be valuable to anyone who utilizes it, including yours truly :). Keep doing what you are doing – i will definitely read more posts. I¡¦ll right away grab your rss as I can’t to find your e-mail subscription hyperlink or e-newsletter service. Do you’ve any? Kindly allow me recognize so that I may just subscribe. Thanks. I¡¦ve learn some good stuff here. Certainly worth bookmarking for revisiting. I surprise how much effort you put to make one of these excellent informative website. Hiya, I am really glad I’ve found this information. Today bloggers publish only about gossips and internet and this is really annoying. A good blog with exciting content, this is what I need. Thank you for keeping this website, I’ll be visiting it. Do you do newsletters? Can not find it. Nice post. I was checking continuously this blog and I’m impressed! Very useful info particularly the last part 🙂 I care for such information much. I was looking for this certain information for a very long time. Thank you and best of luck. Thank you, I’ve recently been looking for information about this subject for ages and yours is the greatest I have found out so far. However, what in regards to the bottom line? Are you sure in regards to the source? I must show my appreciation for your kindness in support of folks who absolutely need help with this one topic. Your special dedication to getting the message all-around ended up being especially effective and has all the time helped individuals like me to get to their pursuits. This insightful hints and tips means a whole lot a person like me and even more to my peers. Warm regards; from everyone of us. Helpful information. Lucky me I discovered your web site accidentally, and I am surprised why this accident didn’t took place in advance! I bookmarked it. Wow, marvelous weblog format! How lengthy have you been running a blog for? you make running a blog glance easy. The full glance of your web site is great, as smartly as the content! Thank you for sharing excellent informations. Your web-site is very cool. I am impressed by the details that you have on this web site. It reveals how nicely you perceive this subject. Bookmarked this web page, will come back for more articles. You, my friend, ROCK! I found simply the info I already searched everywhere and just could not come across. What a perfect site. You completed certain good points there. I did a search on the theme and found mainly persons will consent with your blog. Whats Going down i am new to this, I stumbled upon this I’ve found It positively useful and it has aided me out loads. I’m hoping to contribute & help different users like its aided me. Great job. Of course, what a great site and revealing posts, I definitely will bookmark your website.Have an awsome day! I’m still learning from you, but I’m trying to achieve my goals. I definitely love reading all that is written on your website.Keep the information coming. I liked it! Very well written story. It will be useful to anyone who employess it, as well as me. Keep up the good work – for sure i will check out more posts. Great awesome issues here. I¡¦m very satisfied to see your article. Thank you a lot and i’m having a look ahead to contact you. Will you please drop me a e-mail? I do like the way you have framed this specific issue plus it does give me a lot of fodder for consideration. However, through what precisely I have observed, I just simply trust as the actual responses pile on that men and women continue to be on point and in no way get started upon a soap box of some other news du jour. Anyway, thank you for this excellent piece and though I do not concur with the idea in totality, I value the standpoint. Thanks for any other informative website. Where else could I am getting that kind of information written in such a perfect method? I’ve a mission that I’m just now operating on, and I have been on the glance out for such information. A lot of thanks for each of your hard work on this web page. My mother delights in carrying out investigations and it’s easy to see why. Almost all know all relating to the dynamic means you present invaluable techniques on this web site and in addition welcome participation from the others on that topic then our favorite simple princess is always being taught so much. Have fun with the rest of the new year. You are always conducting a very good job. Howdy very cool website!! Man .. Excellent .. Wonderful .. I’ll bookmark your website and take the feeds additionally¡KI’m glad to find numerous useful info here in the publish, we want develop more strategies in this regard, thanks for sharing. . . . . .
Wow, fantastic blog format! How long have you ever been blogging for? you make blogging glance easy. The whole glance of your website is magnificent, as smartly as the content material! Someone essentially lend a hand to make seriously articles I would state. This is the first time I frequented your website page and so far? I amazed with the analysis you made to make this actual publish amazing. Excellent job! Thank you for any other magnificent article. The place else may just anybody get that kind of information in such an ideal means of writing? I’ve a presentation next week, and I am at the search for such info. Simply want to say your article is as astounding. The clarity in your post is just nice and i could assume you’re an expert on this subject. Fine with your permission allow me to grab your feed to keep up to date with forthcoming post. Thanks a million and please carry on the rewarding work. Wow, wonderful blog structure! How lengthy have you ever been blogging for? you made running a blog look easy. The overall look of your site is wonderful, let alone the content! Hi, I do believe this is an excellent site. I stumbledupon it 😉 I will revisit yet again since I bookmarked it.